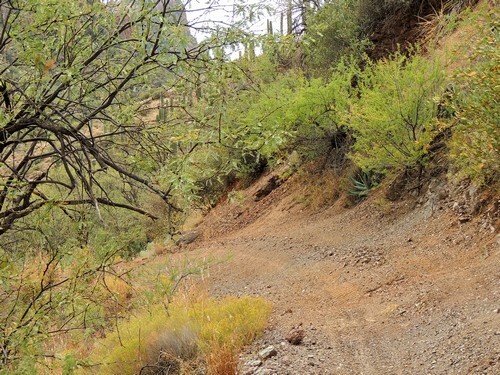 A scenic Jeep trail from the Queen Valley golf course to the Woodbury trailhead on Montana Mountain. The trail starts on the edge of the golf course in Queen Valley. Be wary of errant balls. It continues past a few hints of civilization until turning into a Jeep trail headed for Hardt Tank Hill. 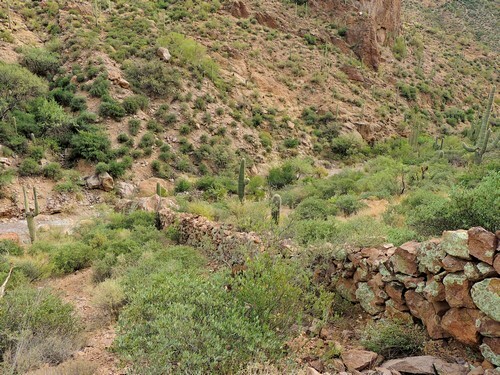 The Rough Riders Jeep Club out of Queen Valley brushed the lower portion of the trail in 2016. The upper portion is still quite brushy. ​There is a GPS - gpx track at the bottom of the page. The view from Hardt Tank Hill is great, and the trip down it can be interesting for stock Jeeps if there has been recent erosion. 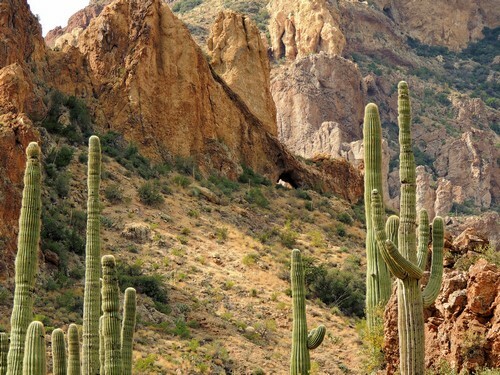 ​A short distance beyond Hardt Tank Hill is where you enter Millsite Canyon. 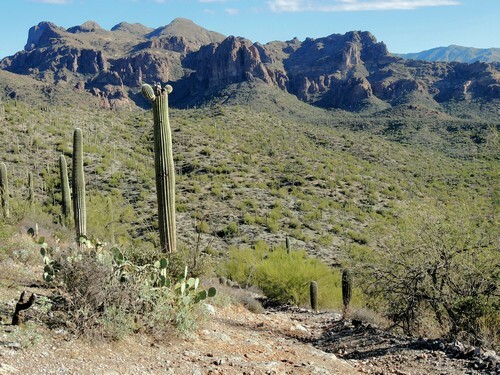 The southern portion of the trail has towering hills and expansive stands of saguaro. 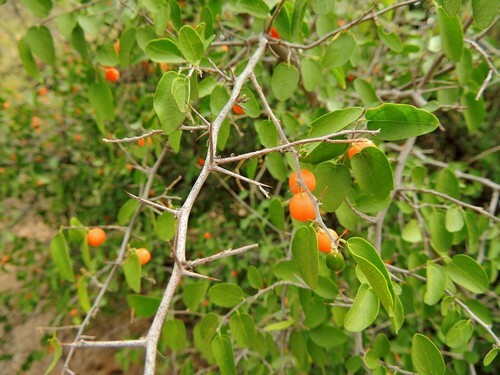 Hackberry is a really nasty bush common in the area. 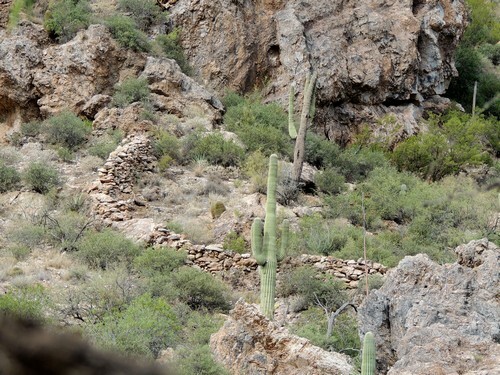 There are two man-made rock walls spanning the canyon from side to side. We do not know the history of them, but are guessing they were built to keep livestock out of the most rugged central part of the canyon. 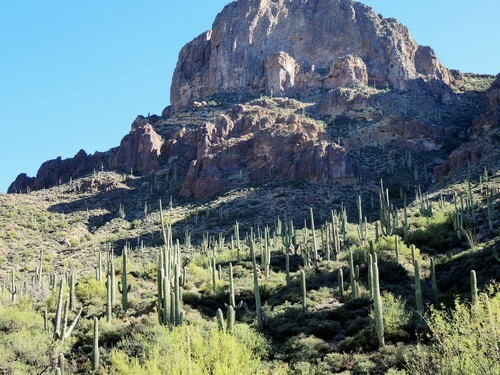 Some people have seen only one of the walls and refer to it as the "Great Wall of the Superstitions". Both walls are visible from the road but you have to look from very specific areas because of the heavy brush. Lower wall viewpoint is 50-100 feet south of a large rock that is part of the wall. Look left of the road. Upper wall viewpoint is between two of the most difficult obstacles on the trail. Also on the left. Waypoints are in the gpx file at the bottom of the page. 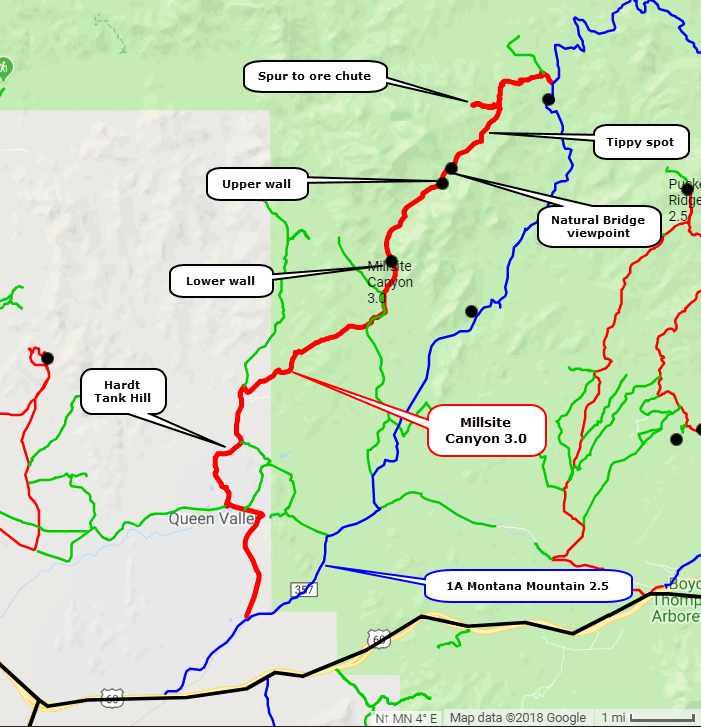 We think the best viewpoint for the natural bridge shown at the top of this page is about a quarter mile north of the upper wall. There is a waypoint in the gpx file. A hill blocks a view of the natural bridge immediately north of this spot, but a view reappears as you go north of the hill. There is a very tippy spot about a mile north of the natural bridge. This will test your tolerance for off-camber situations. 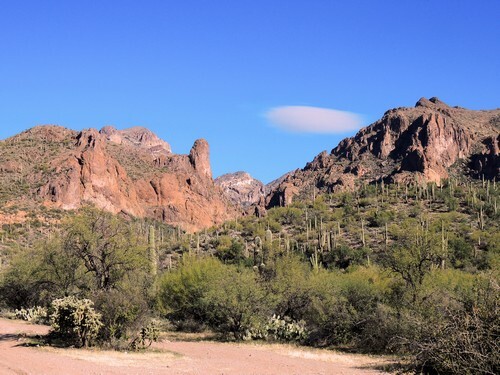 Near the north end of the canyon is a spur that ends on a high point at the edge of the Superstition Wilderness. 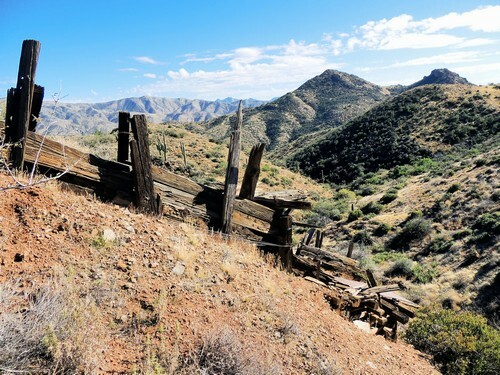 There is an old ore chute below the high point.